You see - I don't really like dolls. In fact those old Victorian china dolls completely and utterly F-R-E-A-K me out. But not Blythe. I'm not sure what it is about her that drew me in but from the moment I set my eyes on her I was hooked. Perhaps her individuality, her freakiness or just that she came from 1972? But one thing is for sure - and that's that I was hooked. Amy Lee sits on my blog header, a Christmas gift from my hubby. The second best thing that he has bought me - EVER (I had my kitty Cheryl for my birthday last year and even though I did actually technically buy her myself..... it's a close cut thing). Then our Blythe family began to grow - my girls who have never been ones for playing with dolls got in on the act too. They treat their dolls with the upmost respect. No dodgy outfits or being left out for the dog to chew. Their girls are loved, dressed, photographed and put away safely in their cabinet at night. 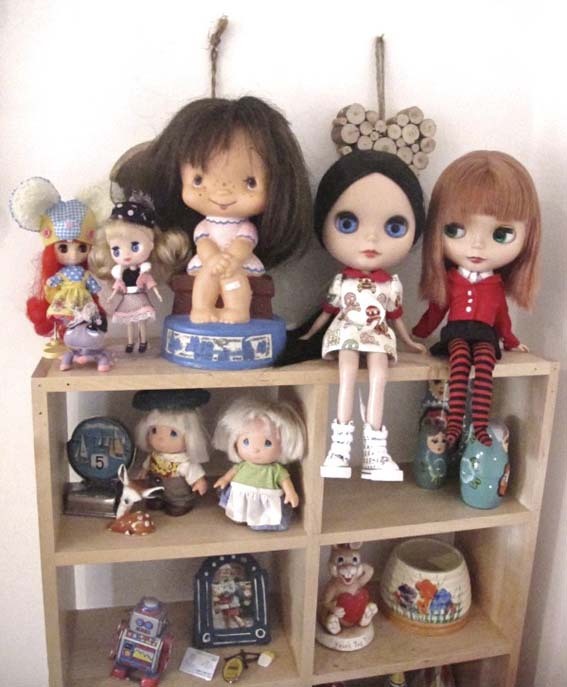 Our collection grew to 13 full size Blythe's and 4 Petit Blythe's. Then a few weeks ago I discovered that Hasbro (who own the Blythe trademark) had launched a collection of Littlest Pet Shop Blythe's. I have to say I was slightly dubious but they are totally on a par with the Petit dolls that Takara produce. I don't think that anyone but a hardened Blythe nut would be able to tell them apart. 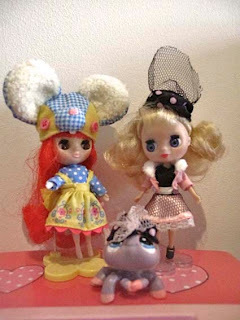 Takara Blythe left, Littlest Pet Shop right. There are four Littlest Pet Shop Blythe set's to collect and at £9.72 from ToysRus they are an absolute steal and a perfect addition to a girls (or her mummy's) Christmas stocking. Anna (all Blythe's need a name you know), now resides in nick-nack corner on my desk! Thank you once again to Toys R Us for choosing us to be TRU Toyologists. We love it! I will be holding a Mega Toys R Us giveaway next week - so stay tuned! I'm with you on the Victorian dolls always scared me witless. But Amy Lee ( now that I know her name) is far from it adn I have no idea why either. Always loved you header! Is that a strawberry of shortcake type dolly I see there?! !